Where are the Austrians.............where are the Prussians? Well I got waylaid. You may have noticed that that in my most recent post, I described the Austrian units as being 24-36 figures. Followers of Wargaming in 28mm will know that my standard unit is 12 figures (4 bases), with some adjustment for historical OB. Well if you go back to my very early posts (the second I believe), my initial basing plan was one which would allow me double the size of my units at some unspecified future time. Well that time has come, thus the delay in my painting all those new armies. Why now you ask? Well there is a number of reasons, I have painted around 35 battalions of French and a similar number of Anglo-Portuguese for my peninsular campaigns. I realised that I really did not need this many units to play most scenarios at the battalion level. The rules I play, FoB and Lasalle both are base dependent sets, while RtoE is more figure dependent. I like all 3 sets and I suspect that I will continue to play all 3 depending on the occasion. I also was growing more and more enamoured of the large battalions. Fortunately, it was quite easy to convert the smaller battalions to the large battalions by the use of magnetised sabots. This of course allows me to go back to my earlier scheme if I want to play a game of Lasalle or FoB involving many more troops as I plan to keep the excess command stands ready. My next decision was to decide on how many bases should make up each battalion. I like to generally keep with historical OB's, but at the same time I have told myself to be a little less obsessive about this. Many rulesets require specific base sizes, etc, etc ..........these are just stupid and reading TMP is always good for a laugh when they all go on out base size this and base size that.......What I like about Lasalle and FoB, is that there is no required base size and both of them allow to some extent for a variable number of bases. 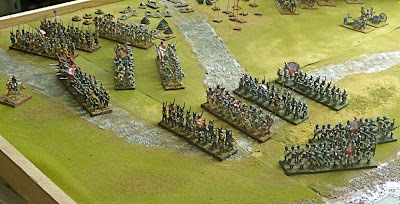 Their only requirement is that the same basing be used for each army; who can complain about that. RtoE is also base size independent, but is interestingly enough also is base independent, but unlike Lasalle and FoB is figure dependent. You need a minimum of 20 figures for small battalions and up to 52 figures for very large battalions (generally recommended a 1:20 figure ratio). I believe this will end up as a generally a 1:25 figure ratio. The great majority of the 40x40mm bases will have 6 figures (made up of 2x40x20mm bases with 3 figures) in 2 ranks, but some 40mm square bases will have a 3 figure British command unit and some of the 20x40mm bases will have 2 elite figures (light) to allow them to break off to skirmish (a neat thing about the RtoE rules). My original 3 figure bases easily allowed all this to happen. 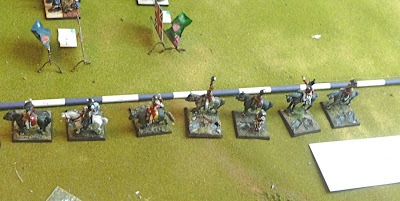 I ended up with 12 French battalions with no work aside from sticking a flexible metal strip to the original base. 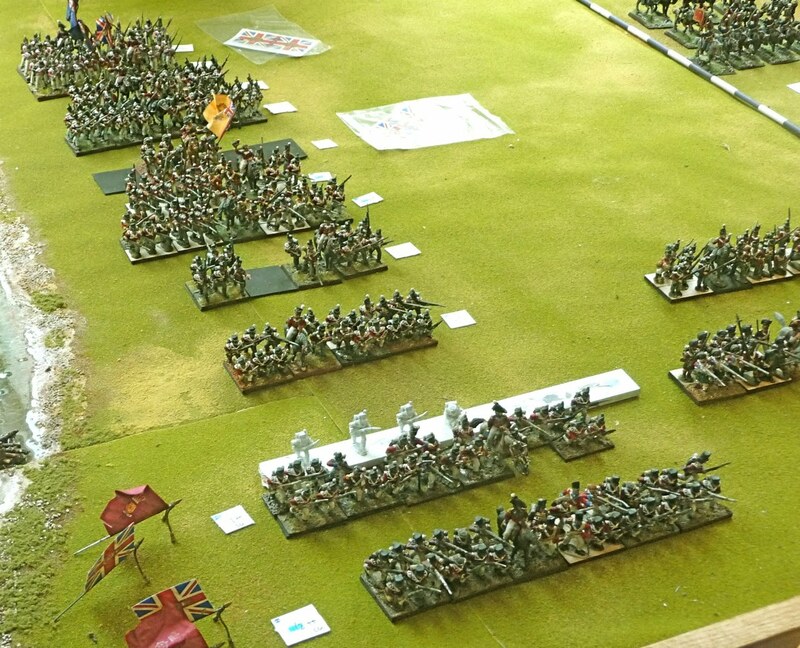 These are mostly 24 figure 4 base units, aside the 9th legére that made it up to 5 bases. I can squeeze I believe 1-2 more units from my existing battalions, but I have to do a little bit of extra repainting. I will keep all the command stands intact, so I can easily change the unit designation depending on the historical OB. There are also a few extra bases which can act as the nidus of new battalions. Very easy the French. The British were a bit more of a challenge and as you can see below it is a work in progress, figures had to be moved about, facings had to be repainted and there is some reterraining of bases to do. I am also doing some re-flaging, as unfortunately many of my GMB flags faded (they were purchased in 2008, the year of the great fade); Grahame Black has been very decent about this and has offered to replace gratis the faded flags. As you can see, I have ended up with 14 British battalions varying from 4-6 bases. I have to do a little extra painting as well (maybe a total of 25 figures). This was somewhat of a challenge as I am a much better painter now than I was 3 years ago when some of these units were painted. It is well worth it though as now my British battalions will finally fly both the King's and their regimental colours. Unfortunately, the 5oth, 43rd, 83rd, 45th, 74th and 42nd have all lost their commands, they do look a little lonely below. I have assured the colonels of the 42nd and the 43rd (need more elite units) that they will be back in service by the end of the year. 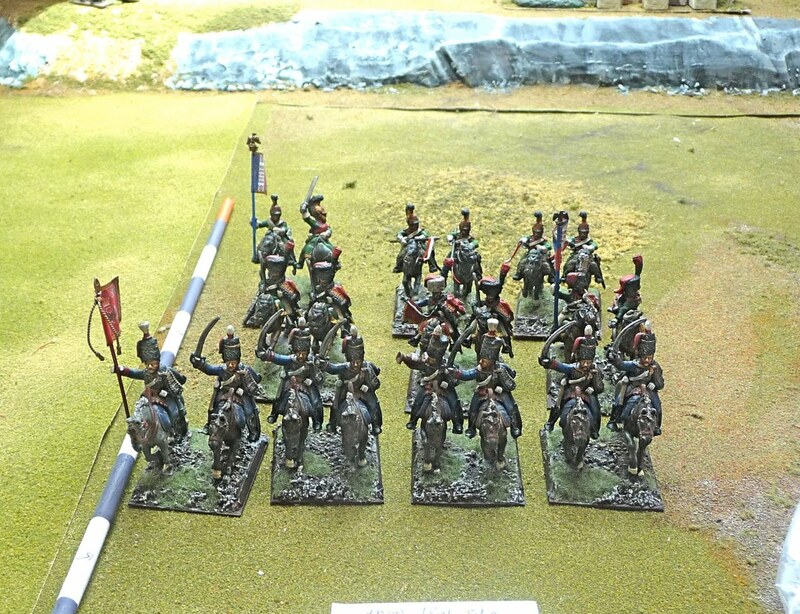 I also have changed my cavalry units bases from 40x40 to 40x50mm. I have quite a few cavalry and did not want to rebase them, I glued a 0.8 mm Litko base to the existing base and did a little terrain fix-up. As you can see they came out quite well. I like using 20mm square magnetic basing for 28mm figures also. Great looking figures, as usual. Phew! - a BIG job! But a very elegant solution to your basing. The six figure stands you've made look the business and will enable you to have a consistent standard for all your armies. A word on your intentions for the Austrians though. At 1:25 a 'German' battalion comes out at 7 figures per company (6 x 180 men on paper) which would translate to a huge 42 figures. Much too unwieldy on the tabletop IMO. I broke it down to 6 figures per company for a total of 36 per battalion - still historically about 20-30% bigger than their French opponents! 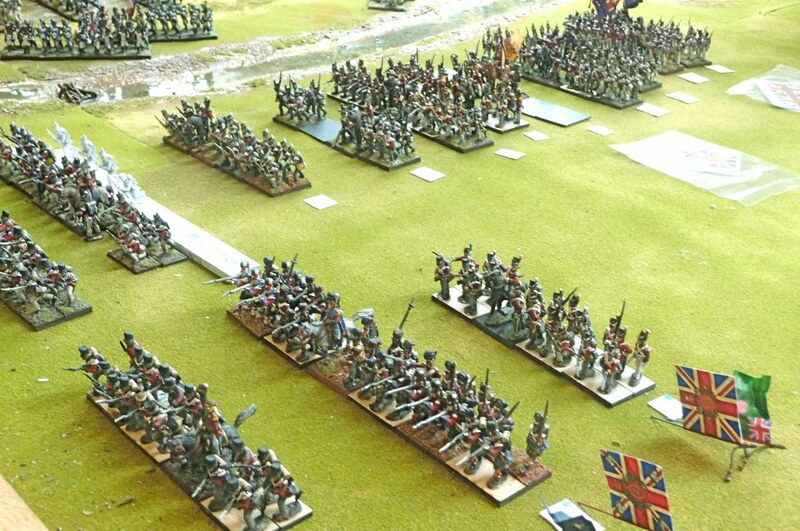 Of course the 'Hungarian' battalions were even larger with 200 man companies - at 1:25 they come out as 48 figures! I usually made them up to 38-40 per battalion so a tad bigger than the German ones but not too much. And remember these are all based on paper strengths rarely achieved in the field - in 1809 most regiments managed three battalions of about 800-1200 men each. Beautiful figures as usual John - hope the above is of some help on your next BIG job! Fine collection, those larger units do look nice on the table. Clever the way you planned ahead from the start though, I have vowed NEVER to rebase another figure ever again!! Thanks for the comments, it is has been not as bad as one would think, and really the big battalions looks nice. I agree Doc, 36 figures is going to be the maximum for me. That is a pretty big transition from 18 figure battalions. ok i bite what is FoB stand for? FoB stands for Field of Battle, one of the Piquet games. I have now 12 Battalions of French Infantry, 36 figures per Battalion. 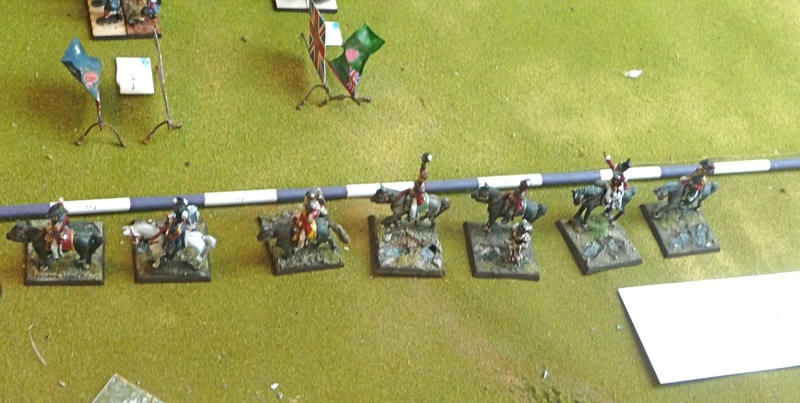 Of the British I have 11 Battalions, with four highland Battalions in the works, all 36 figures. I plan on using smaller units in games as I need too- but love the look and feel of the huge units on the table. Makes for alot of painting, though. speaking intelligently about. I am very happy I found this in my search for something regarding this. truly awesome for people experience, well, keep up the nice work fellows. After going over a handful of the blog articles on your site, I really like your technique of blogging. Please check out my website as well and tell me how you feel. This is an extremely neatly written article. I'll make sure to bookmark it and come back to read more of your useful information. Thank you for the post. I'll certainly return. This is the right webpage for anybody who wants to find out about this topic. that I personally would want to…HaHa). You certainly put a new spin on a subject that has been discussed for many years.